When did you start running? What were your motivations? I quit football and began running at the age of 13. I made this choice because I loved running, I was good and the spirit of my football team was getting worse. Now I keep running because I still love it, I want to push my limits and achieve the high-level goals that I set from my early years in athletics. If you could run with anyone, anywhere, who would it be and where? My dream is to run the New York Marathon with my twin brother. I wanted to run the MDS with him but he could not follow my pace because he was injured shortly before the race. Nevertheless, he finished 28th. Who do you admire and who inspired you? Kenenisa Bekele with 12 World Cross Country Championships, his world records at 5000m and 10,000m and a successful transition to the marathon distance. What are your favourite racing and training conditions? My favourite workout is one in which I push my limits with the help of “sparring partner”, somebody who is better than me. A typical example is a session 20x400m to 2500m on the track Iten in Kenya with a score of Kenyan runners that I met in August 2013. I have no favourite race because I like everything I do: cross country, road and track. MDS is also an exciting race even if it is very different from what I usually do. I loved the fight against the desert and the beautiful landscapes that rewarded our efforts. What is your fondest memory of the race and, conversely, your worst? I keep only good memories of the MDS. I had hard times during the race and it is these moments that marked me, though, because every time I managed to push myself to overcome the desert. I also remember sharing with other runners, members of the organization and my team that supported hospitalized children. What would be your best advice for others tackling a multi-stage self-sufficiency race? There are so many tips that it is difficult to know what is most important! It depends on the objectives of the individual. I speak for those who seek performance because this is what I know best. For my part I did not have specific preparation: before MDS I had never run a marathon and my long runs never exceeded an hour and thirty minutes with the backpack loaded up to 7kg. However I was preparing for the French cross country championships (12km) and was regularly putting 100km weeks. What I found hardest at the MDS was carrying the pack. Mine weighed 8kg, this is too much, and if I do it again I’d like to carry the minimum weight allowed. For food during the race, I would recommend using gels and energy powder because cereal/energy bars are very hard to chew with fatigue! Finally, a very useful tip is to prepare the feet at least one month before the race to avoid blisters. 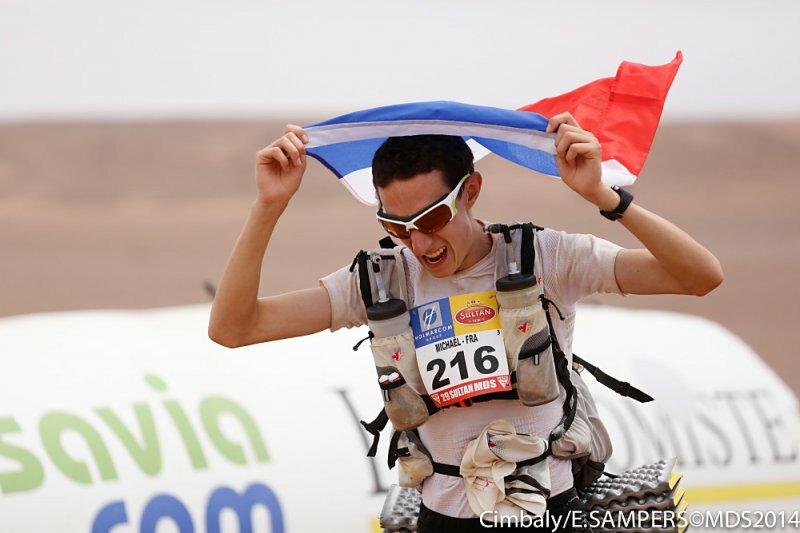 In your opinion what is the best thing about the Marathon des Sables? Discovering the desert with its amazing variety of landscapes. This discovery is not served on a platter and must be earned because it is a very tough race. It required hard work to excel and the organisation never took chances – it was a great team effort to make it work. This entry was posted in Post on Jul 4, 2014 by Al Flowers.